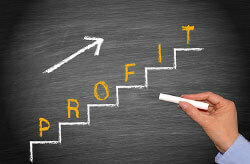 “Profitability is just around the corner.” This is a common expression in the business world. But, the reality is that many businesses don’t make it! Business is tough, profits are illusive, and competition has a habit of moving into areas where profits are available. Sometimes revenue growth only seems to bring on waves of additional expenses. How does one realistically assess the viability of a business? This is perhaps the most critical business assessment a manager must make. Many are taught from an early age to not give up, even in the face of adversity. Certainly there are countless stories of businesses that struggled to survive their infancy, but went on to become highly successful. But, it is equally important to identify business models that simply will not work. 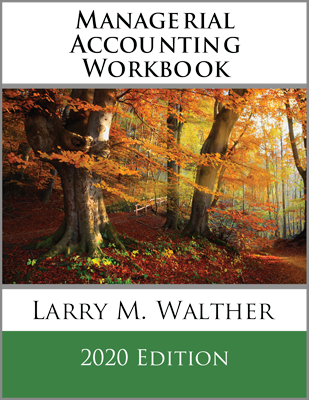 Managerial accounting methods provide techniques for evaluating the viability and ability to grow or “scale” a business. These techniques are called cost-volume-profit analysis (CVP). CVP fundamentally depends upon developing an understanding of the nature and behavior of an entity’s costs. To understand how a business is going to perform over time and with shifts in volume, it is imperative to first consider the cost structure of the business. This requires drilling down into the specific types of costs that are to be incurred and trying to understand their unique attributes. Variable costs will vary in direct proportion to changes in the level of an activity. For example, direct material, direct labor, sales commissions, and so on, may be expected to increase with each additional unit of output. The opposite of variable costs are fixed costs. Fixed costs do not fluctuate with changes in the level of activity. Examples include administrative salaries, rents, and property taxes. GoSound produces portable music players. Each unit produced requires a digital chip that costs $11. At right is a table that reveals rising chip costs with increases in production. For example, $1,650,000 is spent when 150,000 units are produced (150,000 X $11). The data are plotted on the following graphs. One graph reveals that total variable cost increases in a linear fashion. The slope of the line is constant. When plotted on a “per unit” basis, the variable cost is constant at $11 per unit. Increases in volume do not change the per unit cost. The activity base is the item or event that causes the incurrence of a variable cost. It is easy to think of the activity base in terms of units produced, but it can be more than that. Activity can relate to labor hours worked, units sold, customers processed, or other such “cost drivers.” For instance, a dentist uses a new pair of disposable gloves for each patient seen, no matter how many teeth are being filled. Therefore, disposable gloves are variable and key on patient count. But, the material used for fillings is a variable that is tied to the number of decayed teeth that are repaired. Each variable cost must be considered independently and with careful attention to what activity drives the cost. Assume that GoSound leases the manufacturing facility where the portable music players are assembled. Rent is $1,200,000 no matter the level of production. The rent is said to be a “fixed” cost, because total rent will not change as output rises and falls. The table at right reveals the factory rent incurred at different levels of production and the resulting “per unit” rent amount. The following graphs show how the fixed cost per unit will decline with increases in production. This attribute of fixed costs is important to consider in assessing the scalability of a business. The nature of a specific business will have a lot to do with defining its inherent fixed cost structure. Airlines have historically been burdened with high fixed costs related to gates, maintenance, reservation systems, and aircraft. Airlines struggle during lean years because they are unable to cover fixed costs. During boom years, these same companies can be extremely profitable, because many costs do not rise with increases in volume. Basically, there is not much cost difference in flying a plane empty or full. Software companies have a big investment in product development, but very little cost in reproducing multiple electronic copies of the finished product. Their variable costs are low. Other businesses have attempted to avoid fixed costs so that they can maintain a more stable stream of income relative to sales. For example, a computer company might outsource its tech support. Rather than having a fixed staff that is either idle or overloaded at any point in time, it pays an independent support company a per-call fee. The effect is to transform the organization’s fixed costs to variable and better insulate the bottom line from fluctuations brought about by the related ability to cover or not cover the fixed costs of operations. Every business is unique, and a savvy business person will be careful to understand cost structure. For a long time, the trend for many businesses was toward increased fixed costs. Some of this was the result of increased investment in robotics and technology. However, those components have become more affordable, and there is now more outsourcing, elimination of employee benefits, and so forth. These activities suggest attempts to structure businesses with a definitive margin that scales up and down with changes in the level of business activity. Economists speak of the concept of economies of scale. This means that certain efficiencies are achieved as production levels rise. This can take many forms. Fixed costs can be spread over larger production runs, and this causes a decrease in the per unit fixed cost. In addition, enhanced buying power results (e.g., quantity discounts) as volume goes up, and this can reduce the per unit variable cost. These are valid considerations and must be taken into consideration in any business evaluation. However, care must also be exercised to limit one’s analysis to a “relevant range” of activity. At right is an example pricing table for an electronic part. Notice that the per unit cost ranges from $0.44 down to $0.092 each, depending on the quantity purchased. Despite the large spread in pricing, if a business needed about 250 of these parts, one would study the preceding table and determine that the best quantity to order would be 300 units priced at $13.00 per hundred. As a result, per unit variable cost would be $0.130. The relevant range is the anticipated activity level. Any pricing data outside of this range is irrelevant and need not be considered. 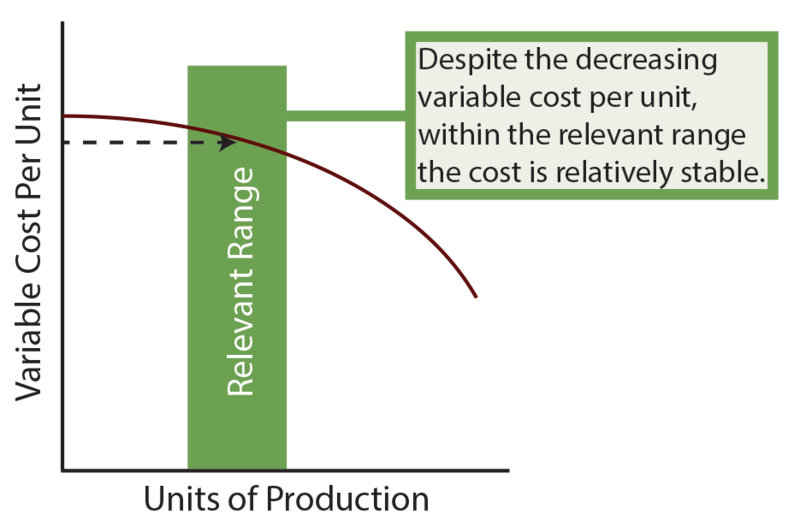 This enhanced concept of variable cost is portrayed in the accompanying graphic. The relevant range must also be considered when evaluating fixed costs. 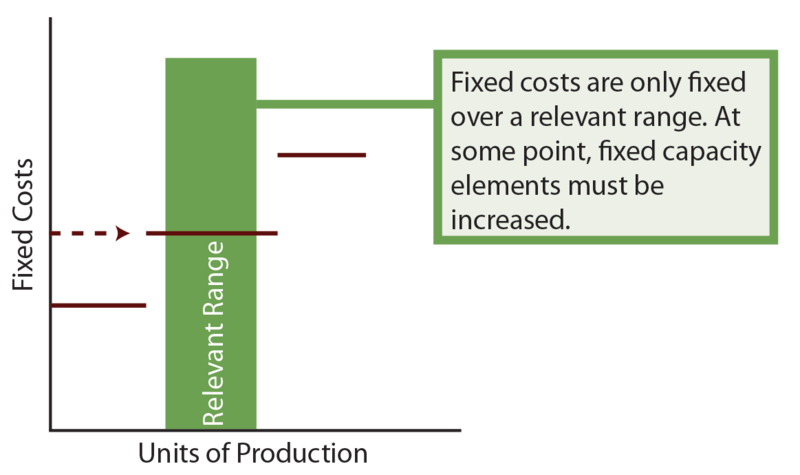 Many fixed costs are only fixed for a certain level of production. For example, a machine can be operating at full capacity. To increase production beyond a certain level, additional machinery must be deployed. This will cause a step upward in the fixed cost. Fixed costs that behave in this fashion are also called step costs. The nature of step costs is illustrated in the accompanying diagram. The key point is to note that both fixed and variable costs maintain their characteristics over some particular range of activity. It is important to understand the full implications of this observation in managing a business. Adopting a business strategy that results in operating levels outside of the relevant range can significantly upset business results via significant deviations between actual and expected performance. In an ideal setting, one would try to produce at the right-most edge of a fixed-cost step. This squeezes maximum productive output from a given level of expenditure. For a machine, it is as simple as running at full capacity. However, for a business with many fixed costs, it is more challenging to orchestrate operations so that each component is fully utilized. For example, one employee might be able to operate three machines but only two are in use. It seems simple to assume that a third machine should be installed but that might require additional building space. Consider that some fixed costs are committed fixed costs arising from an organization’s commitment to engage in operations. These elements include such items as depreciation, rent, insurance, property taxes, and the like. These costs are not easily adjusted with changes in business activity. On the other hand, discretionary fixed costs originate from top management’s yearly spending decisions; proper planning can result in avoidance of these costs if cutbacks become necessary or desirable. Examples of discretionary fixed costs include advertising, employee training, and so forth. Committed fixed costs relate to the desired long-run positioning of the firm; whereas, discretionary fixed costs have a short-term orientation. Committed fixed costs are important because they cannot be avoided in lean times; discretionary fixed costs can be altered with proper planning. Variable costs are also subject to adjustment. In the electronic parts example, it was illustrated how such costs can vary based on quantities ordered. Perhaps one might order and store large quantities of the part for use in future periods. 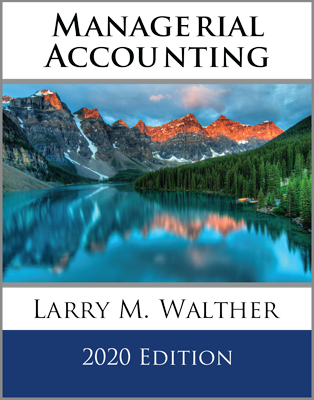 A subsequent chapter shows how to calculate economic order quantities that take into account carrying and ordering costs in balancing these important considerations. Even direct labor cost can be subject to adjustment for overtime premiums, based on whether or not overtime is worked. It may or may not make sense to meet customer demand by ramping up production when overtime premiums must be paid. The interplay between all of the different costs emphasizes the importance of good planning. The trick is to synchronize operations so that the benefits of each fixed cost are maximized, and variable cost patterns are established in the most economic position. All of this must be weighed against revenue opportunities; one must be able to sell what is produced. Differentiate between a variable cost, fixed cost, and mixed cost. 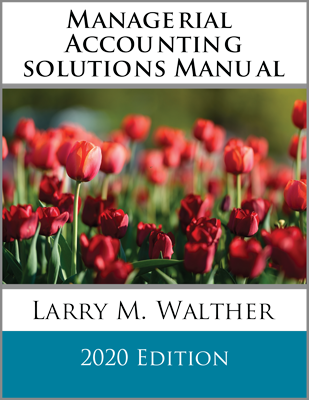 Describe the nature of variable costs, in the aggregate and per unit. Describe the nature of fixed costs, in the aggregate and per unit. Describe the concept of economies of scale. Discuss the nature of specific types of fixed costs: committed fixed costs and discretionary fixed costs. Identify the nature of a step cost, and cite the appropriate business strategy for dealing with step costs.